It can be aggravating to have a program start every time you turn on your computer. If you don’t use AOL Instant Messenger but see it every time you login, or Weather Bug pops up, or Adobe Updater, etc. These all just slow down your startup, and running Windows in general thereafter. If we’ve worked on your computer, we’ve probably limited your start items. This is common practice for any tech savvy person to help “clean up” your computer. The method below may seem technical, but it is in fact quite simple and effective. Here you will see a complete list of items that start when you load Windows. Some may look like Greek to you, no worries! Look for the program you don’t want to load and uncheck it. Click OK and reboot your computer. After your computer loads, you may see a popup warning. Check the box and hit OK. You won’t see it again thereafter. How about all the other stuff you see in that startup list? NONE of it is required to run Windows. However, some of it could be very important. 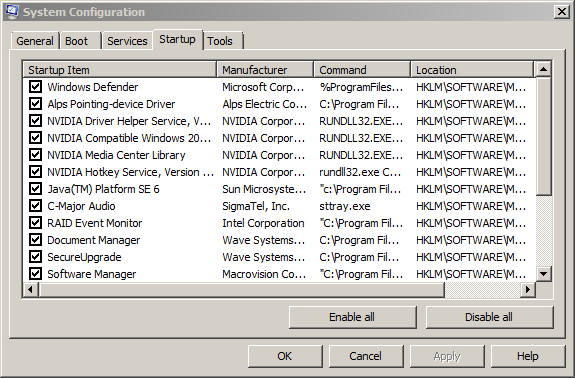 For example, your backup program is probably listed, probably something to run your sound or mouse, etc. Have a look through the list and feel free to turn off anything, give it a try, and turn back on if there is a problem. Be careful here as you could disable something that you shouldn’t. Some programs have built in options for startup. You should review these first. This entry was posted on Tuesday, October 7th, 2008 at 7:49 am. You can follow any responses to this entry through the RSS 2.0 feed. You can leave a response, or trackback from your own site.